In Greek mythology, Mentor was a wise old man who stepped in to look after a young warrior while his father Odysseus went to war. Today, mentors aren’t old men with gray beards and flowing robes. The word has stuck though, and today we refer to a mentor as someone who has skills, knowledge and wisdom that he or she shares with a more junior colleague. Many companies have formal mentoring schemes. These work to pair up less experienced project managers with senior executives from other departments. The mentor and the mentee meet regularly and each discussion is an opportunity for some of that sharing of wisdom to happen. If your company has a scheme like this then you should definitely sign up. It can take a while for you to find someone who is a suitable match, so get your name on the list as soon as you can. If your company doesn’t have a scheme, you can still arrange your own mentor. Seek out a couple of suitable candidates who would be good to work with and ask them. They will probably be flattered, and if they can’t spare the time to help out and be your mentor they may well know someone who can. Whether you opt to join a corporate scheme or go your own way, mentoring can be a very valuable career opportunity. Here are five reasons why a project management mentor is a great asset. A mentor is not your line manager. They are not your project sponsor. A mentor is someone completely independent, who doesn’t work on your project and probably doesn’t even work in your department. To be even more independent you could find a mentor from another company – check out your industry press or project management groups in your area for anyone who could mentor you, and tap into your networks. The great thing about them being independent is that they have no axe to grind with your project or your colleagues. While sometimes it helps to talk to people who know the characters involved in your project, an independent person can give you a completely unbiased view of a situation. This is particularly useful if you find yourself dealing with a lot of office politics as it can be quite difficult to sort out what’s actually happening and how it is affecting people – talking it through with someone on the outside can be very helpful. A mentor is typically someone in a more senior position to you. That means that they probably have access to a wider network than you, and they know a lot more people in senior (i.e. influential) roles. If you have to give a presentation to an unfamiliar audience, or go to a meeting with an executive whom you have never met before, your mentor can give you some insider knowledge about what to expect. As they know people you don’t they can also help you find the right experts to ask if you have a difficult problem to solve. Get them to introduce you – use your mentor to open doors! It can be awkward to talk honestly to your manager about career opportunities, especially if you are considering changing departments or leaving the company completely to move somewhere else. But it is still useful to talk to someone about those challenges, and your mentor is the perfect person. Mentoring arrangements often involve some kind of mentoring contract that spells out exactly what the terms of the engagement are to be. This should include something about keeping your discussions confidential unless you explicitly give permission for the conversation to be shared. If you have got that rule in place with your mentor, you can be honest with them about your career plans. It can be useful to have an impartial person to discuss your options with. As your mentor is likely to work in a different area to you they are also more likely to hear of other career opportunities. Ask them to keep an eye out for any jobs that are being advertised in their area, or any managers who are looking to replace people who are leaving or expand their teams. Many of the good jobs don’t get advertised, so having someone on the inside who can let you know of opportunities as they arise can mean you get an early chance at what could turn out to be a fabulous job. Let’s face it, sometimes our partners, family and friends don’t want another dinner interrupted with tales of woe from work. If you have problems on your project, family members can often give good advice, but they are likely to be on your side and they don’t have all the background about how projects work. A mentor, on the other hand, is there for exactly that. Part of the mentoring arrangement is for you to be able to freely discuss problems with them. Ideally, your mentor will have some project management experience so they will understand the logic behind the decisions you have made and the right way forward for resolving problems. It can also be useful to discuss the sticky project problems with them, like ethics or how to deal with someone who isn’t performing well on the project. As your mentor has more years of experience than you, don’t forget that you can learn a lot of practical stuff from them as well. If you are new to project management or this particular company, get them to share the ways that they manage projects. For example, they may have templates that you can use. Instead of a chat over coffee one day, ask them to come to your desk and show you how to get the best out of the project management software that the team uses. A mentor is a valuable asset to any project manager, regardless of how long you have been doing your job. 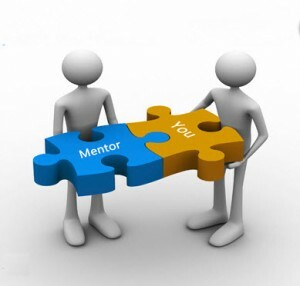 At different stages of your career you will find different types of mentor most appropriate. In the early days when you have just started out as a project manager, someone with lots of technical project experience will be very helpful. As you develop, you may want to spend some time with a mentor who can help you with some of the awkward people problems or the office politics on projects. Later in your career someone in a senior executive job could help you plan out your next move for a similar leadership role for yourself. At any stage in your professional development, a mentor should be someone that you can trust and work well with. Try out a couple of people and don’t be afraid to break off the mentoring relationship if you find it doesn’t work out for you.